Looking to save on expenses for your pet without sacrificing the quality of their care? With a little planning and creativity you can give your little buddy the best of everything without breaking the bank. 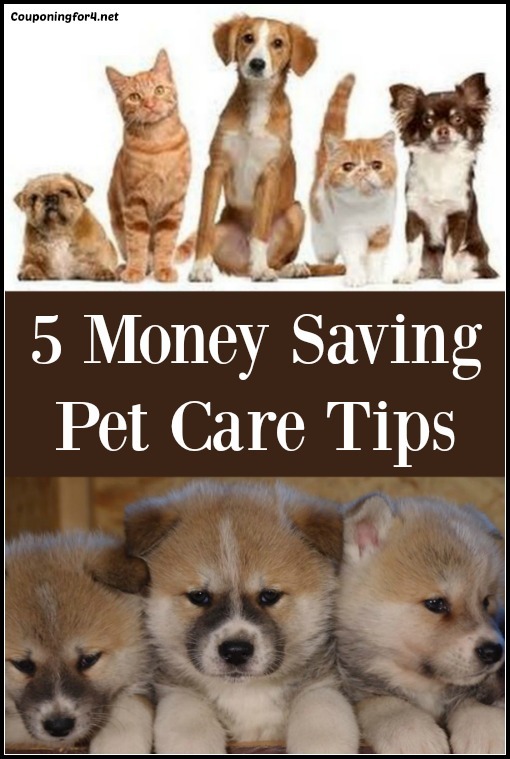 Here are 5 money saving pet care tips! Although many of these tips can be used for your other pets as well, for the purposes of streamlining we will apply them all to the family dog in this post. Save On Grooming – You can save money on pet grooming by keeping up with regular tasks like daily brushing with a good pet brush. This on its own will keep knots and tangles at bay and help brush dirt out of your pet’s fur. You can give your dog a trim with a fur clipper set similar to ones used on human hair to save even more. You also have the option of picking up nail filing/clipping tools, but this can be a bit tricky. You have to be sure you don’t clip too short or you can cause bleeding and infection. Have a groomer show you how to clip your dog’s nails or watch instructional videos on Youtube to help train yourself. If you aren’t comfortable grooming your own pet, watch for special deals at the local pet store or groomer and/or see if they have a loyalty program. That will help you save a little more over time. Save On Pet Food – When it comes to expenses for your pet, food is at the top of the list. Be sure to watch for sales and coupons on your preferred brand of food or see if you can mix and match depending on what is the most affordable at the time. (Not all pets will allow you to mix and match, so keep that in mind!) Check my Coupon Database before heading to the store in order to grab any applicable coupons. What’s more, you can also save money and give your dog great nutrition by cooking your own dog food. This is a very effective option for families that are great at cutting food costs and those that grow and raise food at home. Even if it’s not the bulk of your dog’s diet, you can ensure a nice balance by filling gaps and reducing waste from family cooking. You can find great recipes for dog food and treats online. Save On Veterinary Care – Like humans, your pet will need medical care. You can find great deals on vaccines and neutering at local clinics during special events. Many farm and pet stores have regular events for important vaccines that save you money as well. Your local vet may offer a discount when you have more than one pet so call around for a good deal. You can also get discounts at people stores like Walgreens, the SPCA or pet stores like Petco. Call first for special rates, dates, times, and possible incentives for low income families. Save On Medicines – To save money on pet medications avoid buying them at your veterinary office. Ask your vet if they will write a prescription for your pet’s medications before leaving the office. Compare prices online and you will likely find a much better deal. For some medications, you can look into getting the human equivalent in order to save money. Double check with your prescription and/or veterinary office on dosage, but this is often a very thrifty way to go. Here is more detail on saving on your dog’s medication. Consider Pet Insurance – Particularly if your dog is getting older, you may want to consider getting pet insurance. Medical expenses can run thousands of dollars depending on your dog’s condition, so pet insurance would help you curb that cost. See how much monthly premiums run and weigh that against the cost of what you could be incurring on medical bills to make the right decision for your family. Pay attention to your pet and make sure to sweat the small stuff. If your pet shows signs of any medical or behavioral issues, make sure to have them checked out. Those little things can easily become larger issues that lead to an unnecessary strain on finances and stress levels. Otherwise, enjoy your four legged family members and continue to save where you can.